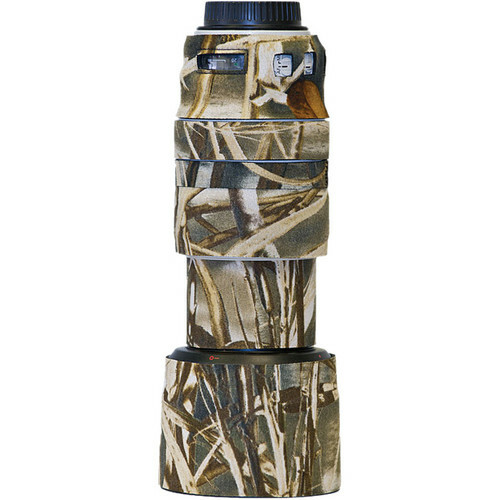 The Realtree Max4 Lens Cover for the Canon 70-300mm f/4-5.6 L Lens from LensCoat is a 100% closed-cell neoprene jacket that protects the lens from bumps and scratches. It is useful for nature and outdoor photographers, as well as sports shooters and photojournalists. It provides a thermal barrier, protecting your hands from cold lens surfaces in lower temperatures. The cover is waterproof, providing protection to your lens in wet conditions. A LensCoat Lens Cover is easy to install and remove, leaving no residue on the lens. This cover can help preserve the resale value of your lens by protecting it from dust, dirt and other contaminants. The Realtree Max4 HD pattern offers effectiveness in open terrain. The pattern features cattails, millet, milo, corn stalks, sunflowers, oak and maple leaves, cedar and oak limbs, plus a variety of other plant life. Please note that the LensCoat for the Canon 70-300mm f/4-5.6L IS USM has a piece with a touch fastened closure to cover the fixed portion of the lens barrel when the lens is fully zoomed. Also included are two optional pieces for use when using the rotating collar. Box Dimensions (LxWxH) 8.5 x 5.5 x 1.0"
Lens Cover for the Canon 70-300mm f/4-5.6 L Lens (Realtree Max4 HD) is rated 3.5 out of 5 by 2. Rated 2 out of 5 by Anonymous from Too Complicated.Too many parts This product is cut up into too many sections that when you finish covering all that is supposed to be covered, the lens does not look good. It's too involved. Rated 5 out of 5 by Ron D from I would buy this product again Great camofloge and the neopreme is what I need for extra protection against hard bumps. The lens cover is divided into sections, so the zoom portion of the lens will have its own piece.